The Jatbula Trail is a trip of a lifetime, giving you the opportunity to walk through Nitmiluk National Park from the famous Nitmiluk Gorge to Leliyn (Edith Falls). The trail is an ancient Song Line used by the Jawoyn people. Overlooking the Seventeen Mile Valley and beyond, the trail features magnificent waterfalls tumbling from the high sandstone escarpment, these then feed into creeks surrounded by shady monsoon forests and the rock outcrops of the escarpment provide great opportunities to view stunning ancient rock art. Add a cultural day and explore Katherine Gorge, Fully guided or take a guide but be self sufficient. 13 departures from late May through to September! 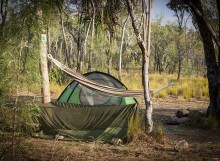 The Katherine region has a lot to offer! Quisque justo lorem, condimentum condimentum ornare vel, consectetur id justo? Phasellus leo lacus, rhoncus dictum auctor.